the Royal Palace, and then back to the hotel. 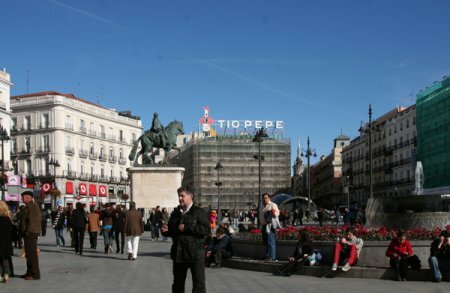 Madrid is beautiful, and crowds of people were out and about, walking, visiting, shopping, etc. We found a fantastic market with fruits, vegetables, fish, pastries, and much more. This is indeed a very nice city for a walk about. That evening we were introduced to the Spanish custom of late dining. The “sit-down” restaurants do not open until 8:30 and we were, of course, the first ones there, at the El Senador, when we arrived at 8:30. The food and wine were excellent. The language differences were not a big problem. 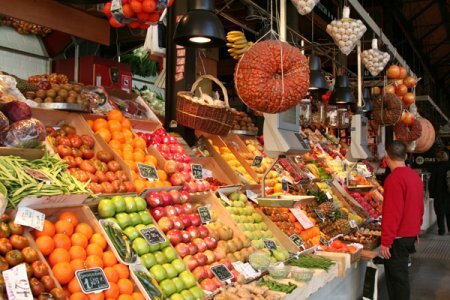 We planned to travel in Spain and Portugal from February 22 through March 9. We were to be joined in Madrid by a daughter and son-in-law on the 24th. They were returning on March 7th from Lisbon, Portugal, whereas we were driving back from Lisbon to Madrid for a day of birding with a local guide on the 8th (which you have already read about here in an earlier post) and departing Madrid on the 9th. With the help of the invaluable Rick Steves 2011 books on Spain and Portugal and a significant amount of online research, our plans were quite detailed before we departed from Des Moines. We had made all of our hotel reservations except for 2 nights in Lisbon, which we deferred because of uncertainty about our schedule in Portugal. We had reserved a car for pickup at the Madrid Airport on the day, the 26th, when we left Madrid to drive to Barcelona. The decision to rent a car came after cost comparisons for the four of us traveling by train or plane on our itinerary in Spain and Portugal. Car rental was far less expensive on a per person basis. Although the rental agency would not guarantee us an automatic transmission car, we were offered one when we went to the rental counter at the Madrid Airport on the 26th, much to the relief of my wife. She had been concerned about driving a stick-shift, and neither of our “children” had ever driven a stick-shift, so it could have resulted in my being the sole driver, except on the open roads where not much shifting would have been required. On the 23rd Barbara and I went to Escorial to see the Monasterio de San Lorenzo de El Escorial. 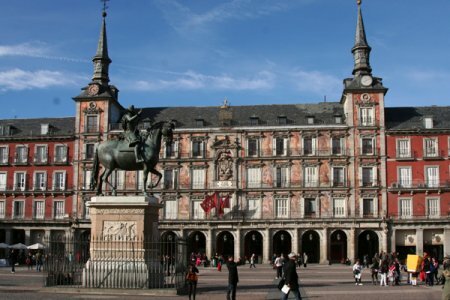 To get there, we walked from our hotel to the metro station, took the metro to the bus station, and rode the bus from Madrid to the bus station in Escorial. We were on a very nice highway with nice views of the snow-capped mountains and pleasant farm fields along the way. Escorial is a nice, smaller town. 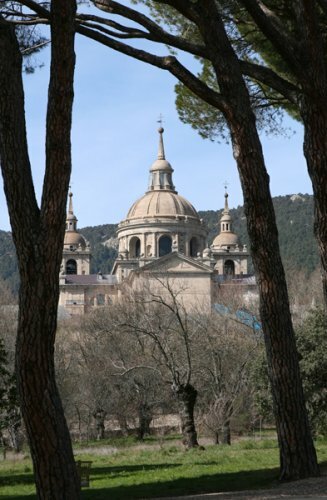 We arrived at the palace/monastery/basilica about 11:30, but it was closed to the public until 2:30 because Queen Sofia was there for an event. We spent our open hours having lunch at a little sidewalk restaurant in the old town and walking in the gardens. The Palace is huge and elaborate. About 25 kings and queens are “encrypted” there in an amazing facility, the Royal Pantheon. We understand that the “rotting room” adjacent to the crypt still contains the remains of the father of the present King, Juan Carlos, who died over 30 years ago. He, Don Juan, was technically never King because Franco took control of Spain before he was crowned, and Franco appointed his son, Juan Carlos, as King when the monarchy was reinstituted. So, controversy exists as to whether “King” Don Juan was really a king, and therefore, whether or not his remains can be placed in the Royal Pantheon. And, to make matters worse, there is only one spot left, so where does that leave Juan Carlos and Sofia? 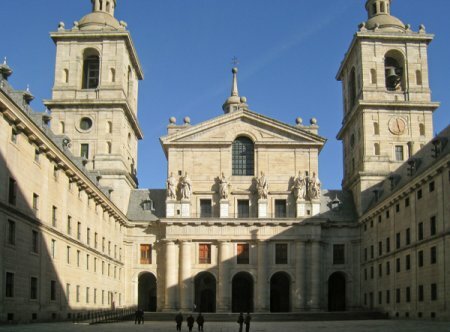 The Palace, Church and Monastery at Escorial are full of beautiful art and objects, many plated with gold. The sculpture of Christ on the cross is magnificient. We became a little disoriented making our way through the labyrinthian facilities and had to hurry to get out before the 6:00 p.m. closing. 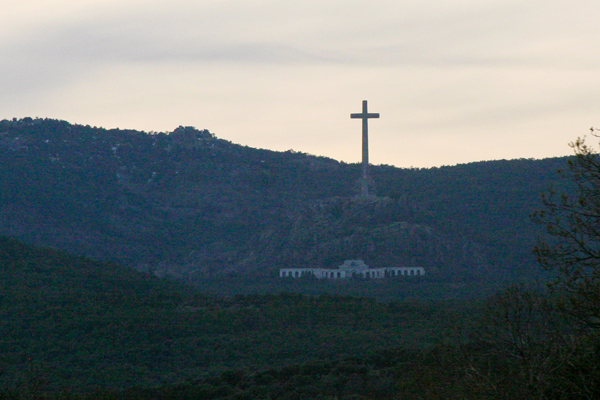 In the distance on the bus ride back to Madrid, we could see the the 500-foot-tall ganite cross marking the Valley of the Fallen (victims of the Spanish Civil War of the 1930s) which is the mausoleum of Franco. We understand that it is currently closed and undergoing a long process of restoration, though it is not that ancient. Tomorrow our kids will arrive and meet us at the hotel. From there we will spend a day of sight-seeing in Madrid, to be followed the next day by a train ride to Toledo and a day of sightseeing there. Sunday, March 27, Barbara and I took part in an interesting “exercise” at the Anahuac National Wildlife Refuge in southeast Texas. 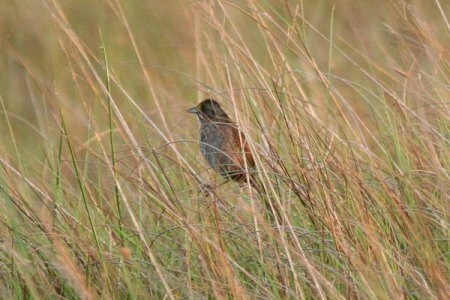 The Friends of Anahuac sponsor “rail walks” each spring to look for the elusive Yellow Rails and even more elusive Black Rails that inhabit the grasslands of the refuge in the winter and early spring. Having never (knowingly) seen either a Yellow Rail nor a Black Rail, I hoped to see one or the other on this, the first walk of the 2011 season. That was not to be. Our leader has conducted these “walks” for 15 years, twice a day for 5 days each spring. Our first walk of the day, commencing a little after 7:00 a.m., came up empty for the 9th time in all of his outings. The going was tough. We lined up behind a short rope with milk bottles attached as the leader and a volunteer pulled the rope through the grass. Supposedly, the rails will not flush unless there is a lot of noise right beside them. The 10 or so participants struggled to keep up, but we were all able to complete the outing. The area we searched has not burned for several years and the grass was high and dense and the ground was wet, often with several inches of water hiding under the dense grass. We were able to stay with it, but we were exhausted. Several falls occurred (with soft landings in the mushy, wet grass). The best birds for the walk were good numbers of Sedge Wrens and Seaside Sparrows. After the walk we explored some of the trails at Anahuac. 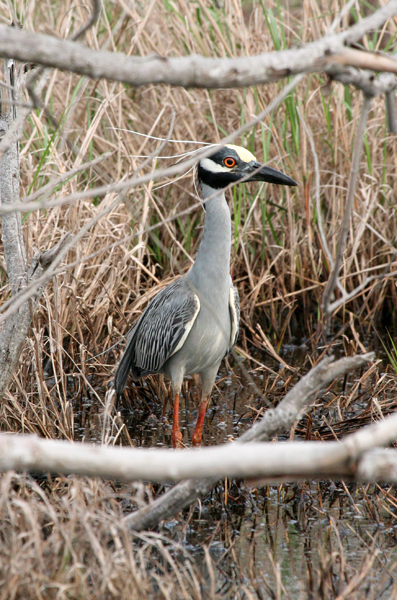 We were rewarded with closeup views of two Yellow-crowned Night Herons in full breeding plumage. We then drove to High Island. I have heard of High Island for years as a prime stop-over for weary warblers migrating across the Gulf of Mexico in early spring. Either we were too early to see any warblers, or weather conditions had not been suitable to create the “fall-outs” for which High Island is reknowned. 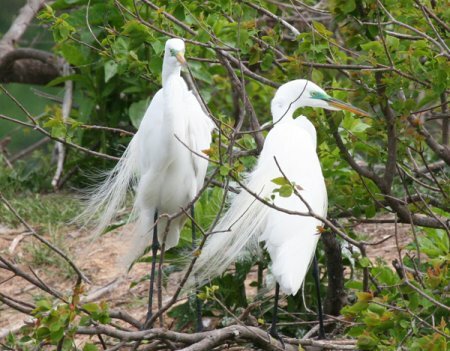 The Audubon Society has acquired several properties at High Island. One of these, Smith Oaks Bird Sanctuary, contains a rookery located on a U shaped island in the middle of a fairly large pond on the Sanctuary. We were fortunate to be there at the beginning of the breeding season. 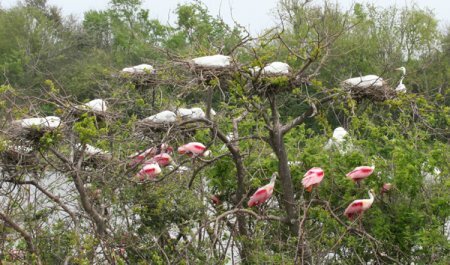 The rookery was filled with nesting Great Egrets and Cormorants, and courting Roseate Spoonbills. 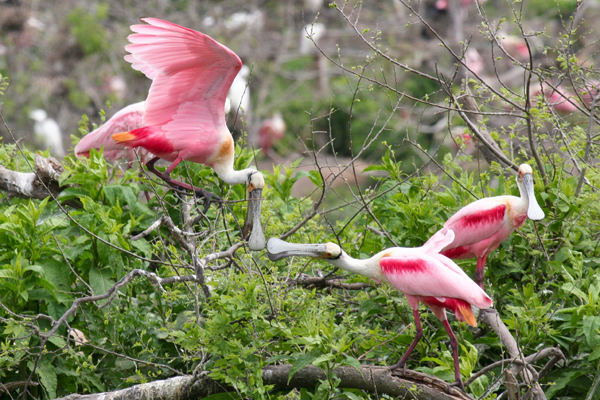 The Spoonbills were exceptionally colorful. 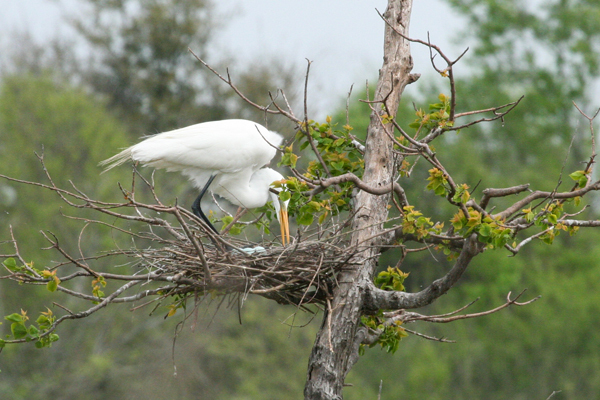 One of the other highlights was the sight of light blue eggs protected by an Egret in her nest. We enjoyed the spectacle for an hour or so before moving on to explore the beach at High Island. 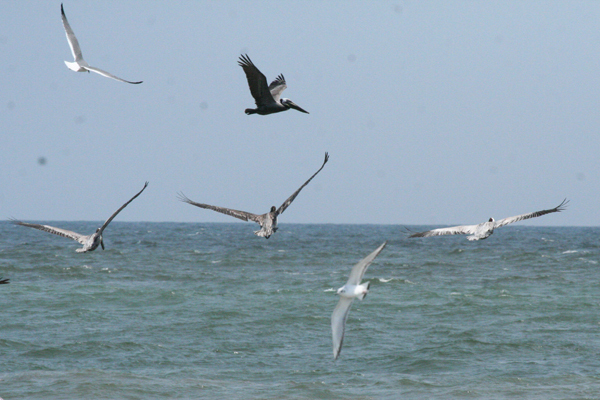 At the beach we were entertained by a myriad of Brown Pelicans, Laughing Gulls and several species of Terns as they dove into the surf for succulent raw fish dinners. We returned to Anahuac for the afternoon walk. Our leader had located a somewhat less difficult area for the afternoon walk. 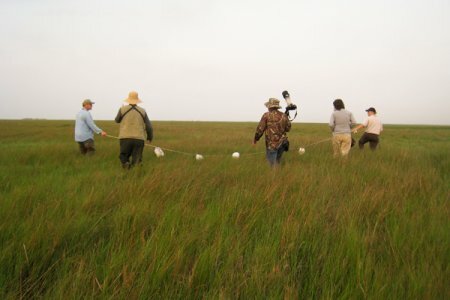 The afternoon participants included a foursome of young birders from Hungary, whose ability to keep pace with the leader made for a better chance of scaring up a Yellow Rail, but taxed us at least as much as the morning “hike” in the taller and wetter marsh. Consequently we cut our participation short and found our way back to the road and our car before the search was completed. Again, we found no rails, and we do not know if any were located by the remaining participants after we bailed out. Again North American Bird number 700 eluded me. Oh well, there will be plenty more opportunities. For those of you who have never participated in a “rail walk”, I recommend that you do it sooner rather than later so that you have the physical stamina for it. Our guide indicated that he once had an 85 year old participant who managed it without apparent ill effects. Personally, I would not recommend waiting that long. Nor would Barbara. On March 8, 2011 at the end of a two week self-guided tour of Spain and Portugal with my wife and 2 family members, I hired bird guide John Muddeford for one day of birding in the Madrid area. John lives near Madrid. He is an experienced Spanish bird guide and speaks fluent Spanish and English. The day in the field with John was the icing on the (very nice) cake for me, and my wife enjoyed it also. Before giving an account of the birding, I want to note that this was my first visit to Spain and Portugal. Because there were four of us travelling together, a rental car turned out to be the least expensive and most efficient method of travel. We rented our car at the Madrid airport after our first 4 days in Madrid, Escorial and Toledo, and during the next 10 days we drove to Barcelona, Granada, Seville, Porto, Lisbon and back to Madrid, about 2500 miles. We avoided driving in the cities as much as possible, by parking the car and using the excellent public transportation systems. The highways in both Spain and Portugal are first class. Driving on the Spanish highways was very comfortable. The driving in Portugal was a bit fightening at times because many drivers greatly exceeded the posted speed limits. This required constant, extraordinary attention to what was coming from behind. In a week or two, when all the photographs have been reviewed, I will begin posting my observations and my wife’s photographs of the Spanish and Portuguese attractions that we visited. Before leaving for Spain I emailed to John Muddeford a list of the species of birds that would be new to me and that appeared from my old and outdated European Field Guide to be findable in the Madrid area in early March. He diligently culled the list and added a few others that he thought might be of interest. It boiled down to about 30 potential new species at that time and place. We actually tallied about 85 species for the day, of which 25 were on my “new” list, and a couple of more new ones were added that were not on the list. For a more complete list of what we saw see John’s report on his website, john@iberianwildlife.com. Perhaps the most iconic birds for me were the White Storks. I had never seen one before the trip and ended it having seen well over 100. These big birds are apparently doing well in Europe. 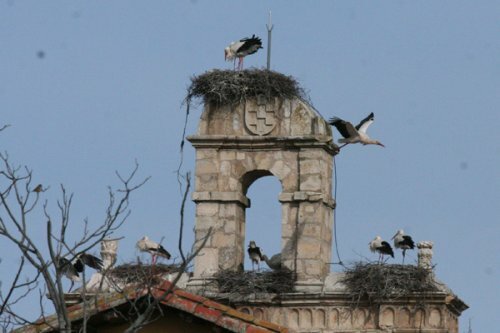 For centuries residents of many European countries have considered the presence of storks nesting on their houses, windmills or outbuildings to be a sign of good luck. 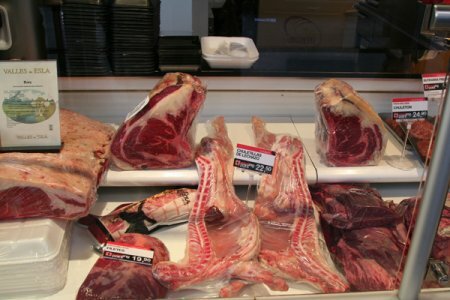 Because of their favorable public image, and possibly also because they do not, I was told, taste good, they have managed to maintain a large population. How they manage to keep their great nests attached to the tops of utility poles and other high vantage points, I do not know. Other birds high on my list were Great Bustards and Little Bustards. 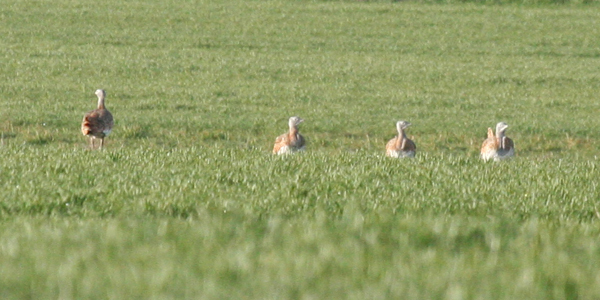 Our first sighting in this category was of a Little Bustard, flying across a green (winter wheat?) field at quite a distance. The white in its wings made it quite apparent that it was what it was. This was the only Little Bustard we saw. The Great Bustards were a different story. Surpisingly, they were fairly numerous and very visibile on the farm fields east of Madrid. We counted at least 35. I am surprised that these big game birds have survived the continuing encroachment of people into their habitats. 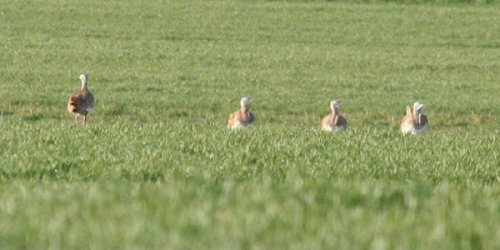 As we finished looking at our first flock of Great Bustards, two Red-legged Partridges came walking close by our car. 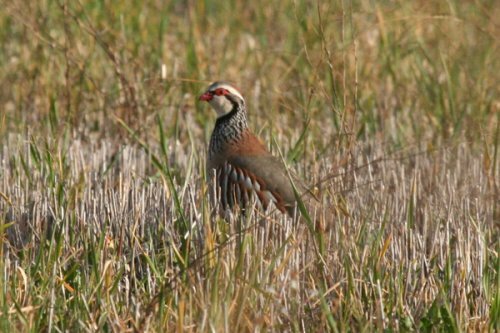 The grass was a bit too tall to see their most prominent feature, their bright red legs, but they are a very beautifully patterned bird nonetheless. 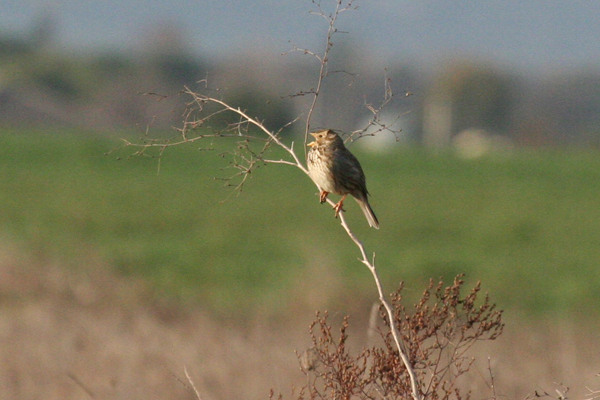 A very plain bird that I have seen mentioned in English literature but never before seen, is the Corn Bunting. These tame little birds were present in great numbers, often singing along the fence rows or from exposed, weedy perches in the farm fields. Although Rock Buntings were not new for me, they were colorful and very accomodating for my photographer. Spain is home to by far the greatest variety of birds to be found anywhere in Europe. 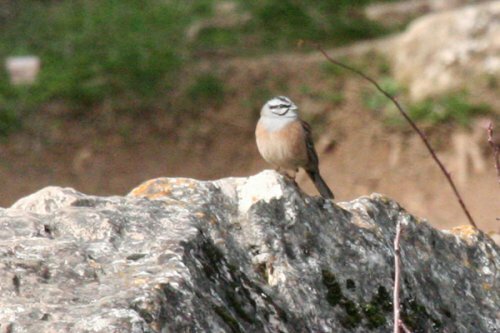 While early March was a good time for us to explore the excellent architecture, historical sites and art museums, it was not the best time to find the many migrating and summer resident birds of Spain. Moreover, the Madrid area is just one of several areas where many different species can be found. For those and other reasons, including the friendly people, fine food and wine, reasonable prices, beautiful and diverse scenery, and pleasant weather, I plan to return to Spain later this spring for a solid week of birding, with John’s guidance, outside the Madrid area. I hope to see 60 or so new species, which will, I think, be enough to satisfy my quest for birds in Europe. And who knows, I and my trusty mount, Rocinante, (did I mention that I plan to travel by rented horse?) may even tilt at a windmill somewhere in La Mancha.